Foreword. Acknowledgements. Towards reliable global bottom-up estimates of temporal and spatial patterns of emissions of trace gases and aerosols from land-use related and natural sources (A.F. Bouwman, R.G. Derwent, F.J. Dentener). Methods for stable gas flux determination in aquatic and terrestrial systems (R.L. Lapitan, R. Wanninkhof, A.R. Mosier). Some recent developments in trace gas flux measurement techniques (O.T. Denmead, R. Leuning, D.W.T. Griffith, C.P. Meyer). Working group report: How can fluxes of trace gases be validated between different scales? (W.A.H. Asman, M.O. Andreae, R. Conrad, O.T. Denmead, L.N. Ganzeveld, W. Helder, T. Kaminski, M.A. Sofiev, S.E. Trumbore). Experimental designs appropriate for flux determination in terrestrial and aquatic ecosystems (D. Fowler). Towards the use of remote sensing and other data to delineate functional types in terrestrial and aquatic systems (J.E. Estes, T.R. Loveland). Working group report: How can we best define functional types and integrate state variables and properties in time and space? (S. Seitzinger, J.-P. Malingreau, N.H. Batjes, A.F. Bouwman, J.P. Burrows, J.E. Estes, J. Fowler, M. Frankignoulle, R.L. Lapitan). Modelling carbon dioxide in the ocean: A review (D. Archer). Simulation models of terrestrial trace gas fluxes at soil microsites to global scales (D.S. Schimel, N.S. Panikov). The application of compensation point concepts in scaling of fluxes (R. Conrad, F.J. Dentener). Working group report: Relations between scale, model approach and model parameters (J.J. Middelburg, P.S. Liss, F.J. Dentener, T. Kaminski, C. Kroeze, J.-P. Malingreau, M. Novák, N.S. Panikov, R. Plant, M. Starink, R. Wanninkhof). Validation of model results on different scales (M.A. Sofiev). 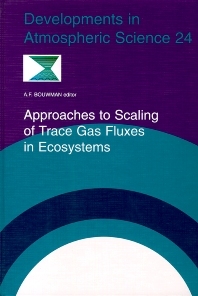 Role of isotopes and tracers in scaling trace gas fluxes (S.E. Trumbore). Inverse modelling approaches to infer surface trace gas fluxes from observed atmospheric mixing ratios (M. Heimann, T. Kaminski). Working group report: How should the uncertainties in the results of scaling be investigated and decreased? (R.G. Derwent, A.R. Mosier, S. Bogdanov, J.H. Duyzer, V. Garçon, S. Houweling, M.A. Sofiev, H.A.C. Denier van der Gon, F. Wania, R. Wanninkhof). Current and future passive remote sensing techniques used to determine atmospheric constituents (J.P. Burrows). Participants and contributing authors. Index.